[NEW VERSION] Dust Vacuum cleaners vacuum attachment，2018 new dust removal tools, is there any place with gaps that the ordinary vacuum cleaners attachment can not sweep? Our vacuum cleaner attachment can help you solve these problems, it can clean up dust anywhere, such as : Keyboard, any gaps, shutter, sofa, vent, drawer, car, pet dust, and more. [UNIVERSAL ATTACHMENT] The is a vacuum cleaner attachment which works with most standard sized vacuum hoses.the blue part is detachable to adapt with smaller or bigger hose.The interface diameter of the vacuum attachment is 1.3 and 1.48 inches. We also give you two straws switch heads, in case of any problems encountered in use, it can be changed at any time, do not affect your hygiene. [HANDLE DESIIGN] Comfort and control of the handle ergonomic grip, compact and lightweight, you can easily remove the dust in the room. [EASY TO USE] Just connect this to your vacuum remover and you can clean as seen on TV, flexible tubes, strong suction and long size all of this can impress you deeply. 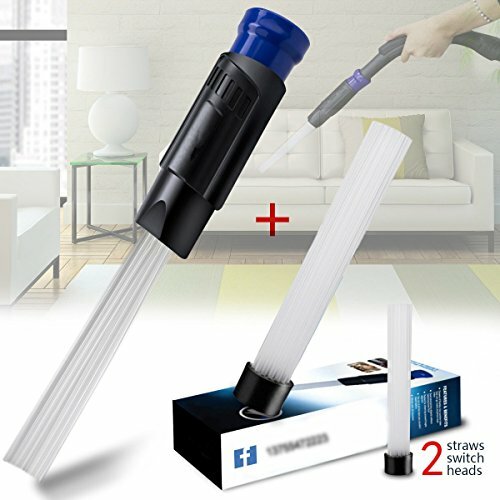 [SAVING YOUR TIME] This accessory is flexible, we can easily clean up the place that other attachment can not clean without moving anything, more than 30 straws ensure that other items will not be inhaled by the vacuum cleaner during the process of dust inhalation, which is more convenient for you to clean.